I know, I know, it's been awhile since my last post. I'm supposed to update this regularly so people will keep coming back and reading. But I'm so busy living life that I don't have time to update my blog! Good problem to have, no? The thing that prompted me to write today's entry is that I wanted to introduce you to a new blog written by my father. 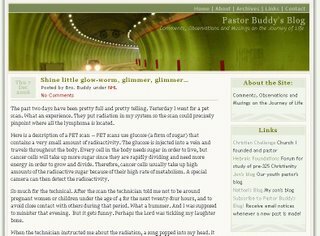 It's called "Pastor Buddy's Blog" and it's hosted at our church's website. Dad was recently diagnosed with Non-Hodgkins Lymphoma and is beginning to walk through the journey of dealing with this disease and the treatment. I convinced him that it would be a good thing if he were to keep a blog about his experience, to sort of let people "look over his shoulder" and "peek into his heart" as he walks through the journey of healing. I feel like it will help our church as well as potentially help others in the future who may stumble across it. Dad has a great attitude about NHL and this journey he's embarking upon. His greatest desire is that God get glory out of this somehow. He knows God could heal him instantly. He also knows God could use medical science to bring healing. Beyond that, he knows that whether he lives or whether he dies, he is the Lord's so he wants the Lord to be honored through this journey. 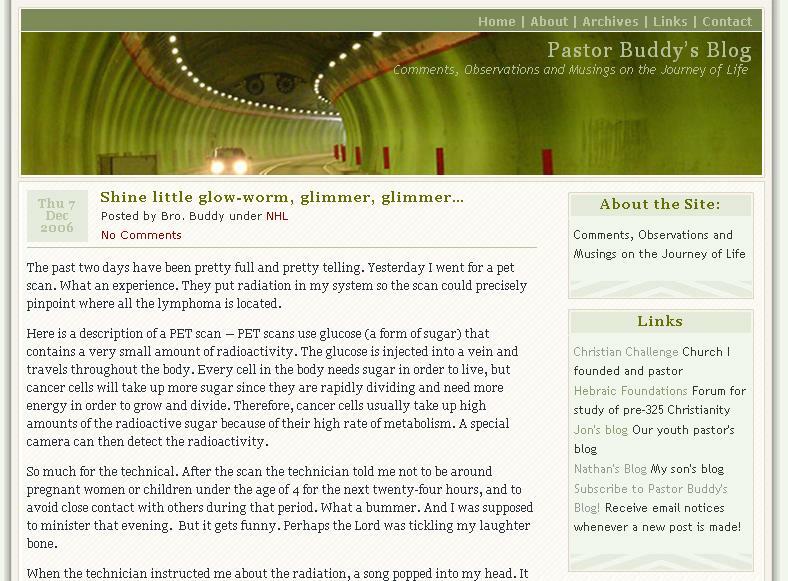 I hope you'll check out "Pastor Buddy's Blog". I think you'll be blessed. While you're there remember to register or subscribe so you can be automatically notified whenever he puts a new post there. That's all for now. Blessings!